St. Andrew’s was a Church of England Aided Primary School, founded in 1858. 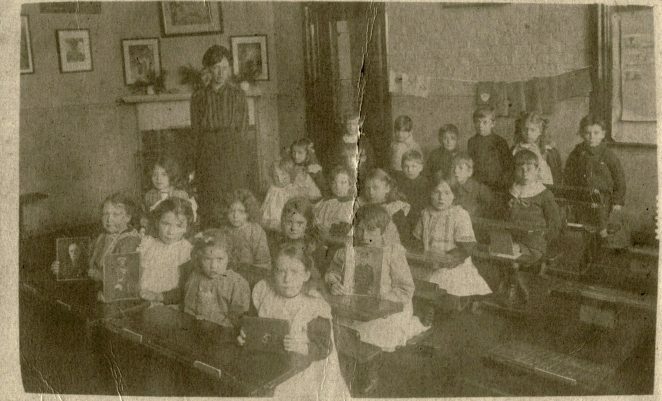 Taking its name from St. Andrew’s Church, the original school stood for 119 years in George Street, Hove. A new school was constructed in 1977 on the site of the churchyard. Children at St. Andrew's taken approx 1916. Some of the children are holding photos of military. Back row on the right is Basil Heryet age 7. 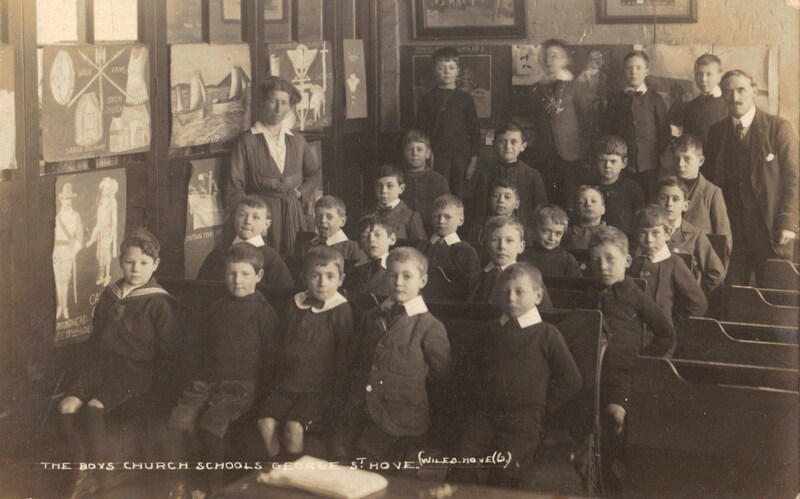 Boys at St. Andrew's taken in 1918. Basil Heryet is on the right 4th row. The top picture looks like the room for class 6 I had in 1949 with Mrs Whiting, the headmaster’s wife. The lower picture looks like the room for class 10 I had in 1952 with Mr Gardner. Seeing all my predecessors in class is a bit spooky, as they look better behaved than we were. This doesn’t look anything like the school when I attended it in the 1960’s. Mr Jones was Headmaster and his wife was the school secretary. We used to attend church every wed morning. Our teacher got married and changed from Miss Green to Mrs White, she named her son Reuben. We used to walk to the King Alfred to go swimming, and it was always a rush. My mum was a dinnerlady, so was Mrs Smart, Mrs Cole and Mrs Duffy. The janitor used to dress as Father Christmas each year! When we were in charge of putting the record on for everyone to come into assembly, we used to always choose the fast ones. If it was a wet playtime, we used to all be in the hall together, with lots of comics. I enjoyed ‘nature’ class with Miss Golding, it meant we could make daisychains in the churchyard….. Comment for Victoria. I loved Mrs Duffy as the dinner lady. She always gave me three helpings of mash. I was at George St School as it was known then from 1948 to 1953. I arrived in Hove from Canada in 1955. We rented a flat in Cromwell Road and my brother and I were enrolled in George Street School. After two days we were sent home by the headmaster, Mr Evans, as we were wearing jeans, tee shirts with pictures on them and leather jackets with tastles on the arms. We then had to be kitted out at the school uniform shop at the end of the road with short trousers and blazer etc. I remember the outside toilets with no roof, playing jacks in the playground and flicking cigarette cards up against the wall in break time. On one occasion, a rat was running around the main room which was then trapped behind a door by a teacher who ‘finished’ it off by using a spade that he kept swinging up and down behind the door. The school meals were a bit iffy as I remember and I do remember clearly having to stand on my chair while the puddings were eaten as I had not cleared all my plate. The sweet shop across the road and Woolies at the top of the road. Sad that the building has gone. I was at George Street school in the early 1950s. I remember Mr and Mrs Whiting. Then Mr Evans took over from Mr Whiting as headmaster. Mr Evans was a lot stricter. I remember Chris. I also remember Mark Fallon, John Froggat, Pauline Goddard, Sally Thornett, Janet Cording. One of the best teachers was a Mr Leaney who used to catch a train each day to and from Ditchling. He was a lovely man who never let you sit with hunched shoulders. Yes we had outside toilets, and used to sit in the graveyard on summer days when we had drawing lessons. It didn’t do us any harm. I enjoyed my schooldays and am still in touch with friends I started school with all those years ago.